See also my page in the Indiana University Cognitive Science Program. Here is my capsule biography, as well as a more detailed curriculum vita. I retired from the Indiana University faculty in June, 2012, but continue to be active in research. My official Indiana University retirement biography is here. Paul Erdös(0):Irving Kaplansky(1):Peter Freund(2):Tohru Eguchi(3):Andrew Hanson(4). Paul Erdös(0):Itshak Borosh(1):Stephen Fulling(2):Peter Gilkey(3):Andrew Hanson(4). Paul Erdös(0):Frank Harary(1):Louis Kauffman(2):George Francis(3):Andrew Hanson(4). Paul Erdös(0):Pavol Hell(1):Eugene Speer(2):Tullio Regge(3):Andrew Hanson(4). Paul Erdös(0):Daniel Kleitman(1):Sidney Coleman(2):Roman Jackiw(3):Andrew Hanson(4). Paul Erdös(0):Vance Faber(1):Emanuel Knill(2):Gerardo Ortiz(3):Andrew Hanson(4). My participation in the history of computing began in high-school when I was a programmer for the PLATO computer-based teaching project, for which I implemented one of the first functional simultaneous multiuser operating system kernels. Information about my involvement in PLATO, along with many other fascinating details, can be found in Brian Dear's book "The Friendly Orange Glow - The Untold Story of the PLATO System and the Dawn of Cyberculture" (Brian Dear, Pantheon, 2017). My Academic Genealogy traces back through Carl Friedrich Gauss, starting from my PhD thesis ("A Dual Resonance Model for Meson-Nucleon Scattering") under Professor Kerson Huang at MIT (August, 1971). A basic chart of my personal academic genealogy can be found here, and a more detailed graphical representation, including my Ph.D. advisor Kerson Huang, his students, and the relation of my own students to his later research is represented in this (graph). (See also my Huang genealogy memoir (text) (graph only) from "Memorial Volume for Kerson Huang". 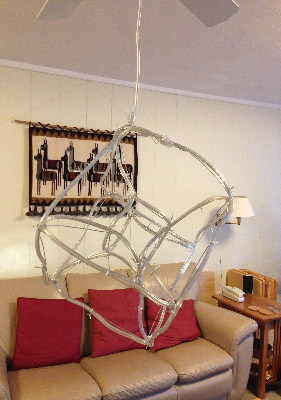 My family also has connections with the history of physics through the Manhattan Project. The Atomic Heritage Foundation's collection of memoirs and artifacts regarding the project includes an entry for my father, as well as a profile for me. On July 25-26, 1956, our family survived the sinking of the ocean liner Andrea Doria. We learned many interesting things at 50th anniversary gathering held in 2006 at the United States Merchant Marine Academy; in particular, the Academy faculty has constructed a full-scale virtual reality simulation of the collision, and presented a related argument that Piero Calamai, the Andrea Doria's captain, was unfairly held responsible for the incident. A memoir on our family's experiences that I wrote for the 60th anniversary, 26 July, 2016, is here. Some musings along with graphics of the Doria sinking that I wrote to accompany a talk I gave on July 26, 2013 (the 57th anniversary) can be found here. In May 2017, I contributed an oral history on my childhood Andrea Doria experience (similar to the written memoir) to the StoryCorps archive. An excerpt is at the very end (after -14:00) of this WFIU public media broadcast. My mother not only survived the Doria, but was one of the oldest among those survivors upon her death at age 98 in 2016 (the 60th anniversary); in 2012, she published a unique environment-oriented book, "East-Central Illinois: Exploring the Beginnings" on the geological, ecological, and cultural history of the plains of central Illinois (website and hardcopy orders here). The family has now released the eBook for free download here. My Google Scholar Profile gives a nice picture of the various fields I have worked in. My DBLP Profile is another useful (but incomplete) list of my Computer Science publications compiled by the DBLP project. B581, Graduate Computer Graphics, taught about 30 times. Public B581 syllabus: Overview of B581. This is an OpenGL-based course introducing the mathematical foundations and practical programming methods of modern interactive computer graphics. The homework involves coding in C using OpenGL and GLUT, and mastering the theoretical principles upon which OpenGL-like graphics is based. The course emphasizes creating interactive interfaces to help understand the graphics objects and techniques being studied. Lighting and simple material modeling are covered as an introduction to the creation of realistic images. Public B689 syllabus: Overview of B689. This course focused on Mathematica-based methods of producing rapid prototypes solving complex software modeling problems. 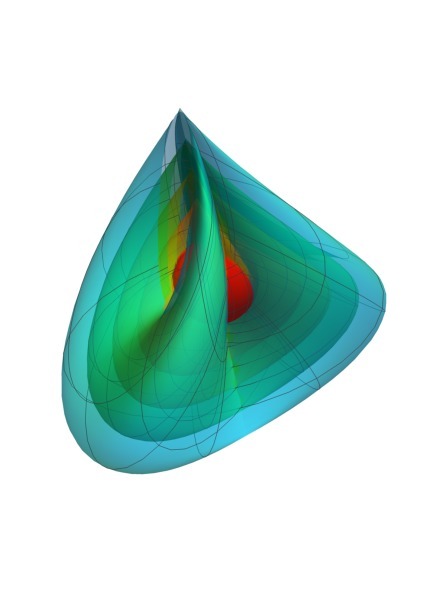 This class will start with an introduction to the Mathematica programming environment, and will incorporate Mathematica prototyping methods implicitly into a broad survey of mathematical modeling methods, techniques, and folklore used widely throughout computer science, computer graphics, scientific visualization, mathematics, and physics. My most recent research focuses on several areas: Mathematical Physics, Applications of Quaternions, Human Interfaces for Effective Learning, and Scientific Visualization. 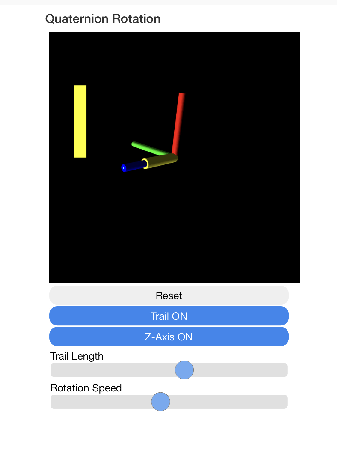 This WebGL App (implemented by Leif Christiansen from a corresponding OpenGL desktop application) uses the left-mouse (or 1-finger) drag to apply a 3D rotation to a triad of axes, each corresponding to a column of a 3D rotation matrix. As the rotations accumulate, the left-hand bar shows the corresponding quaternion q0 component, and the thick tube emanating from the origin shows the (qx,qy,qz) 3-vector component. If q0≥0, the components show in yellow, and if q0<0, the components show in blue. The entire viewpoint can be rotated without changing the matrix or its quaternion components using mouse-right, and alt-left-mouse restricts the rotation to the z-axis for pedagogical study. The application is here: The QuatRot App. Shown below are my graphical representations of the Calabi-Yau quintic representing the hidden dimensions of string theory, based on my 1994 paper. These were made available on the Wiki Commons domain in 2014, and clicking on the images takes you to the source material. The first is a 2-dimensional cross-section of the quintic in CP2, and the second is a complete 6-dimensional representation of the (local C4) quintic embedded in CP4 using 4D discrete samples in a C2 subspace to produce a hypercubic array of the corresponding varying 2D cross-sections. Shown below are my graphical representations of the isometric embedding of the Eguchi-Hanson metric, the k=1 case of the Ak asymptotically locally Euclidean (ALE) Einstein metrics, from the this paper. 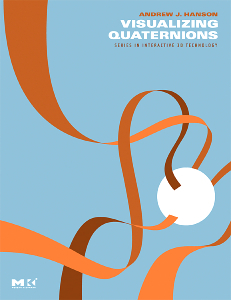 Extensions and Exact Solutions to the Quaternion-Based Translational and Rotational Coordinate Matching Problems, by Andrew J. Hanson (April -- August 2018). We have examined the problem of transforming matching collections of data points into optimal correspondence. The classic RMSD (root-mean-square deviation) method (sometimes referred to as the "Orthogonal Procrustes Problem,") calculates a 3D rotation that minimizes the RMSD of a set of test data points relative to a reference set of corresponding points. Similar literature in aeronautics, photogrammetry, and proteomics employs numerical methods to find the maximal eigenvalue of a particular 4x4 quaternion-based matrix, thus specifying the quaternion eigenvector corresponding to the optimal 3D rotation. We have determined exact algebraic solutions to the corresponding 4x4 matrix eigensystems for both the 3D and 4D matching problems in a preliminary preprint posted on the ArXiV, arXiv:q-bio http://arxiv.org/abs/1804.03528. Improvements on this preprint have generalized and corrected some of the early results as well as analyzing the quaternion-based orientation-frame problems and the combined translational and rotational problems. This extended version, including closed-form RMSD-style solutions for 3D and 4D spatial data sets, orientation-frame data sets, and combined spatial/orientation-frame data sets, is under review. A copy of my lecture notes from WTC-2018, 17 October 2018, giving details of the 3D spatial solution can be found here. [DQT3] Quantum Interval-Valued Probability: Contextuality and the Born Rule, by Yu-Tsung Tai, Andrew J. Hanson, Gerardo Ortiz, and Amr Sabry, (Physical Review A, 97, (5), 1 May 2018). DOI: 10.1103/PhysRevA.97.052121. We present a mathematical framework based on quantum interval-valued probability measures to study the effect of experimental imperfections and finite precision mesasurements on defining aspects of quantum mechanics such as contextuality and the Born rule. This work continues our systematic investigation into finite precision, limited resources, and errorful processes in quantum mechanics. An early preprint is posted on the arXiv: https://arxiv.org/abs/1712.09006. 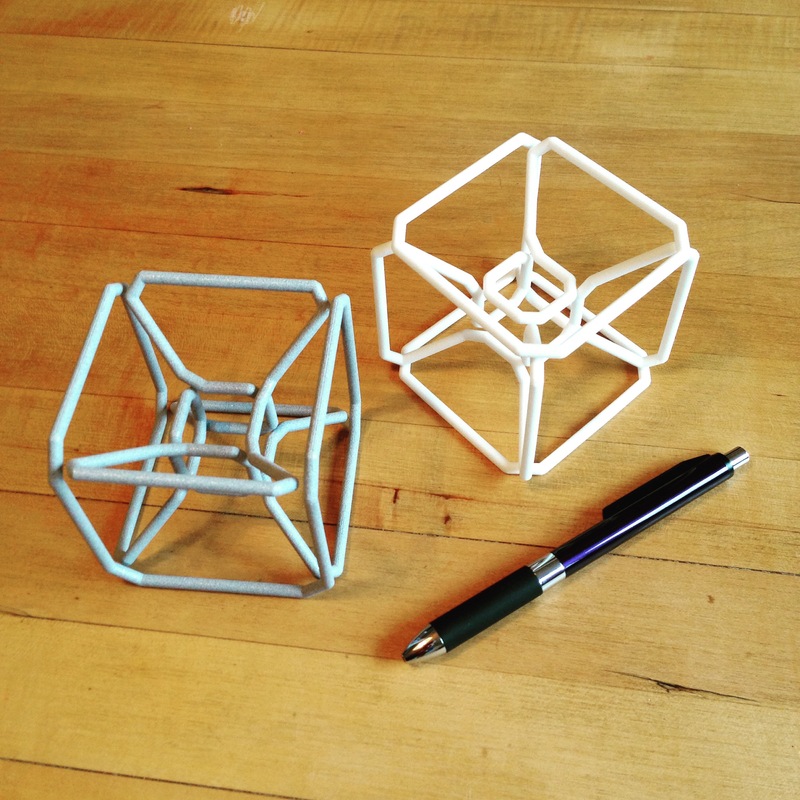 Isometric Embedding of the A1 Gravitational Instanton, by Andrew J. Hanson and Ji-Ping Sha, pp. 95-111, appearing in "Memorial Volume for Kerson Huang, " Ed. K.K. Phua, H.B.Low, & C. Xiong, World Scientific Pub. Co., Singapore (2017). ISBN-13: 978-9813207424, ISBN-10: 9813207426, available here. A local copy can be found here. Memories of Kerson Huang, by Andrew J. Hanson, pp. 13-16, appearing in "Memorial Volume for Kerson Huang, " Ed. K.K. Phua, H.B.Low, & C. Xiong, World Scientific Pub. Co., Singapore (2017). ISBN-13: 978-9813207424, ISBN-10: 9813207426, available here. A local copy can be found here. Charting the Interstellar Magnetic Field behind the Interstellar Boundary Explorer (IBEX) Ribbon of Energetic Neutral Atoms, by P.C. Frisch, A. Berdyugin, V. Piirola, A.M. Magalhaes, D.B. Seriacopi, S.J. Wiktorowicz, B-G Andersson, H.O. Funsten, D.J. McComas, N.A. Schwadron, J.D. Slavin, A.J. 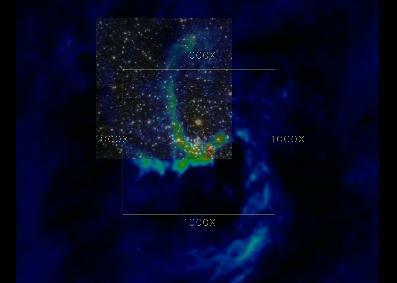 Hanson, and C.-W. Fu, appearing in Astrophysical Journal, November, 2015. A local copy can be found here. [DQT2] Discrete Quantum Theories, by Andrew J. Hanson, Gerardo Ortiz, Amr Sabry, and Yu-Tsung Tai, appearing in J. Phys. A: Math. Theor. 47 (2014) 115305 (20pp) (March, 2014). This work continues a systematic investigation of the formulation of discrete quantum computing using finite fields, and introduces that concept of Cardinal Probability as a way of dealing with probabilistic concepts in the absence of ordered numbers for finite fields. The DOI link is doi:10.1088/1751-8113/47/11/115305. A local copy can be found here. [DQT1] Geometry of Discrete Quantum Computing, by Andrew J. Hanson, Gerardo Ortiz, Amr Sabry, and Yu-Tsung Tai, appearing in J. Phys. A: Math. Theor. 46, no. 18, pp. 185301 (22 pages), (2013). The DOI link is doi:10.1088/1751-8113/46/18/185301, This work presents the mathematical elements of the consequences of formulating quantum computation and qubits in terms of discrete, computable numbers, using complexifiable fields with finite characteristic. A local copy can be found here. Scheduling Scaffolding: The Extent and Arrangement of Assistance During Training Impacts Test Performance, by Jonathan G. Tullis, Robert L. Goldstone, and Andrew J. Hanson, appearing in the Journal of Motor Behavior, pp 01--11, (2015) The DOI is DOI:10.1080/00222895.2015.1008686. Putting Science First: Distinguishing Visualizations from Pretty Pictures. Andrew J. Hanson, "Putting Science First: Distinguishing Visualizations from Pretty Pictures," in Visualization Viewpoints column, Theresa-Marie Rhyne, editor. IEEE Computer Graphics and Applications, Vol 34, No. 4, pages 63--69, (July/August 2014). A local copy is here. Interactive Exploration of 4D Geometry with Volumetric Halos Weiming Wang, Xiaoqi Yan, Chi-Wing Fu, Andrew J. Hanson, and Pheng-Ann Heng. ``Interactive Exploration of 4D Geometry with Volumetric Halos.'' In Proceedings of Pacific Graphics 2013 (Singapore, October 7--9, 2013). The DOI link is DOI:10.2312/PE.PG.PG2013short.001-006. A local copy is here. Multitouching the Fourth Dimension. By Xiaoqi Yan, Chi-Wing Fu, and Andrew J. Hanson, IEEE Computer, Volume 45, Number 9, pp.80-88 (September, 2012). The IEEE site for the article is here, and a local copy can be found here. Localization of polymerase IV in Escherichia coli By Sarita Mallik, Ellen M. Popodi, Andrew J. Hanson, and Patricia L. Foster. "Interactions and localization of Escherichia coli error-prone DNA polymerase IV after DNA damage," J. Bacteriol. (June 2015). Accepted manuscript posted online 22 June 2015. DOI link is here doi:10.1128/JB.00101-15, Abstract is here, and the pre-publication manuscript is here. Mutational Topology of the Bacterial Genome. By Patricia L. Foster, Andrew J. Hanson, Heewook Lee, Ellen Popodi, and Haixu Tang. "On the Mutational Topology of the Bacterial Genome," G3: Genes, Genomes, Genetics, Volume 3, no. 3, pp. 399--407 (March 2013). Pub Med link: is here, DOI link is here, and the Journal URL link is here. 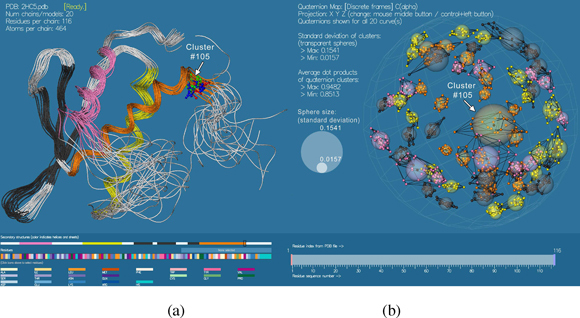 "Quaternion maps of global protein structure," By A.J. Hanson and S. Thakur, appearing in Journal of Molecular Graphics and Modelling, Volume 38, September 2012, pp. 256--278. The paper PDF site is here, and a local copy can be found here. Talk. Matching Paired Sets of Space Space and Orientation Data, Andrew J. Hanson ``Matching Paired Sets of Space Space and Orientation Data,'' 17 October, 2018. Wolfram Technology Conference 2018 (16--19 October 2018, Champaign, Illinois). Talk. Matching Stuff with Quaternions and Hough, Andrew J. Hanson ``Matching Stuff with Quaternions and Hough,'' 22 June, 2018. ASIC 2018 (17--22 June 2018, Loano 3 Village, Italy). Talk. The 4D Room, Andrew J. Hanson ``The 4D Room,'' 20 July, 2017. ASIC 2017 (15--20 July 2017, Interlaken, Switzerland). Talk. Discrete Quantum Computing, Andrew J. Hanson (with Gerardo Ortiz, Amr Sabry, and Yu-Tsung Tai), Seminar for Quantum Computing Group, Computer Science, Oxford University, Oxford, UK (25 July, 2014). Talk. The Bugcatcher. Andrew J. Hanson (with Jonathan Tullis and Rob Goldstone), ``The Bugcatcher,'' 25 June, 2014. ASIC 2014 (23--27 June 2014, Moab, Utah). Talk. Multitouching the Fourth Dimension. Andrew J. Hanson, ``Multitouching the Fourth Dimension,'' ASIC 2013 (24--30 July 2013, Cortina d'Ampezzo, Italy). Course. Quaternion Applications. Andrew J. Hanson: Presented at Siggraph Asia (Singapore, 29 November, 2012). New application topics included optimal, smoothly controllable tubing and tube texturing, quaternion protein maps, and how dual quaternions solve the century-old conundrum of how a quaternion acts on a vector. Click here for a larger version 4Dice is my (free) iPhone App first posted in 2012. 4DRoom, first posted in 2017, is an extension of the 4Dice context to the interior of a 4-dimensional room, including a virtual-reality mode that rotates in the 4D wx plane as you rotate your body with your iPhone. 4Dice is an interactive application using our 4D Rolling Ball algorithm combined with the graphically correct 4D backface-culled representation of the hypercube introduced in the 4Dice video animation (see below). This is a collaborative project with Xiaoqi Yan, originally at NTU Singapore, and Prof. Philip Chi-Wing Fu, now at CUHK, Hong Kong. 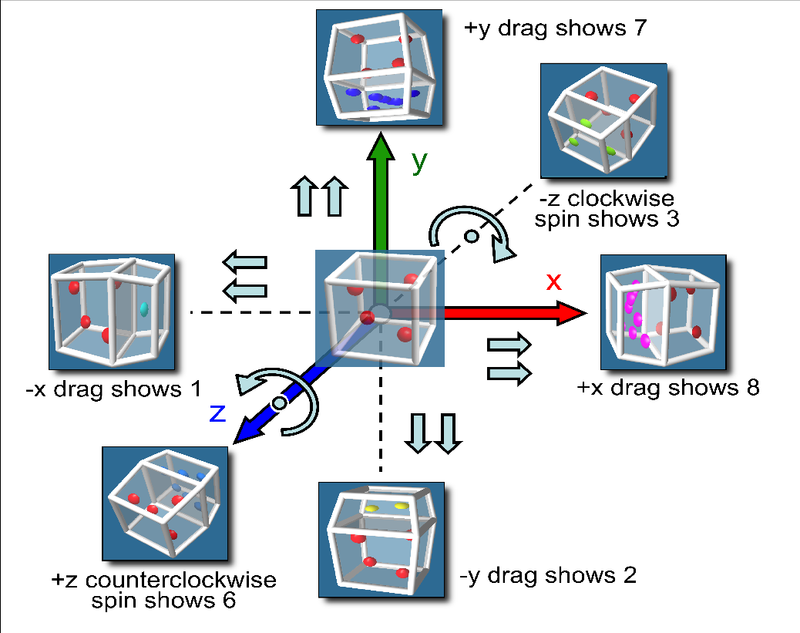 The extension of 4Dice to handle the context of the 4DRoom was implemented principally by Leif Christiansen at Indiana University. For the mathematical details of the 4D control design of 4Dice, see our IEEE COMPUTER paper (pdf link: here.) IEEE Computer, Volume 45, Number 9, pp.80-88 (September, 2012). Alternative site for PDF: see also here. 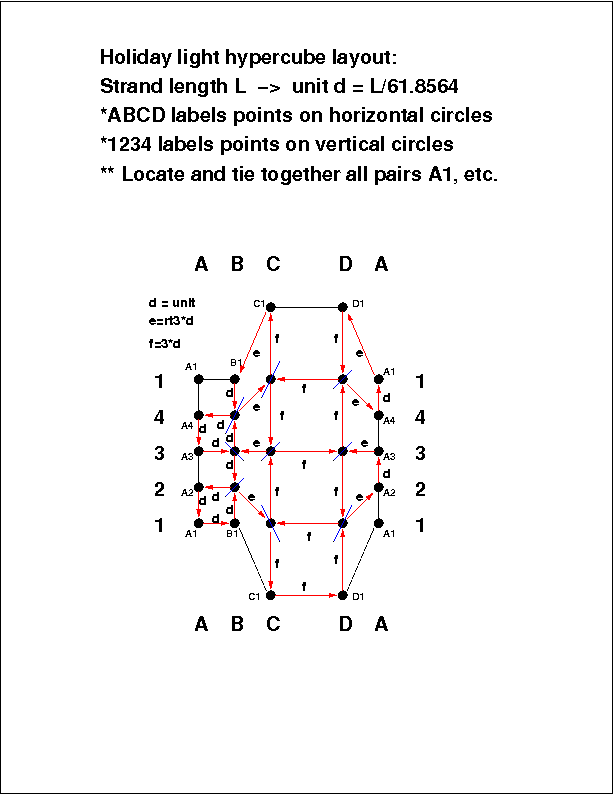 The 4Dice one-minute YouTube video from 1995 provides a quick introduction to the issues of properly visualizing a back-face culled hypercube; the 4Dice iPhone App provides interactive exploration of all the concepts introduced in this animation. Visualizing Quaternions (Morgan-Kaufmann/Elsevier, 2006, ISBN 978-0-12-088400-1) is a comprehensive approach to the significance and applications of quaternions, and focuses on the exploitation of Quaternion Fields, a tool developed primarily by the author. The official website for the book is maintained by the publisher, and provides background material, downloadable material from tables, and demonstration software. I maintain a local companion website here, which may be more up to date. Updates and Errata: All known errata have been corrected in the Elsevier eBook and print-on-demand hardcopies as of mid-2018, including the last known correction to several problems in Chapter 29 on 4D rotations using quaternions (see just those corrections in the revised Ch. 29 pdf file.) Note: We are still working with Elsevier to repair the copyright page of both the eBook and the print-on-demand harcopies to include some notation to distinguish the corrected copies from the original, uncorrected, copies of the book, but they have so far been apparently powerless to fulfill that request. If you have an older copy of the book, please check the list of known corrections that is maintained on the update and errata page (supplemented by the fixed Chapter 29 pdf file). In the older errata, for example, note that there are several array indices that are transposed in the C Program in Table E.3, page 446. Addition: An example of something I should have included in the book is the closed form double-reflection quaternion form q = ( A · B, A × B ), inadvertantly omitted from the Clifford Algebra treatment in Chapter 31. This is kind of cute because we know that A and B are 3D unit vectors, with a total of 4 degrees of freedom, and we know that quaternions, although they are 4-dimensional, have only three independent degrees of freedom. There is one unwanted degree of freedom, but it is elegantly removed by observing that the expression for q is a fibration -- there is a one-parameter invariance under the 3D rotation leaving ( A × B ) fixed. 2012 Winner: JMGM Graphics Prize. Another example image from this paper. Winner with co-author Sidharth Thakur of the 2012 JMGM Graphics Prize. See also the MGMS/Elsevier Graphics Award. 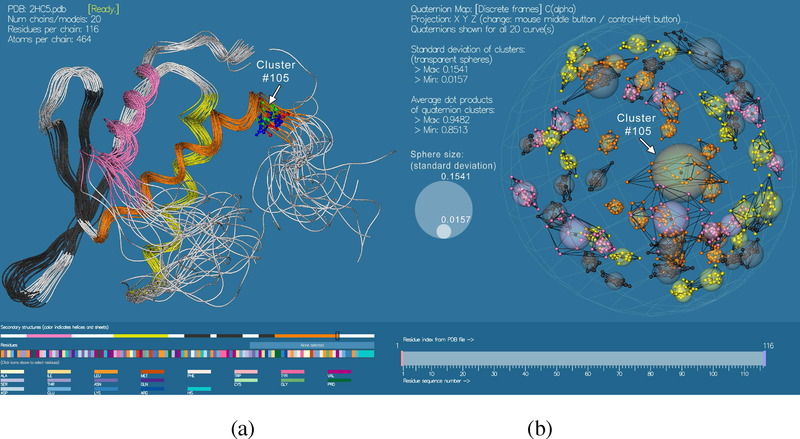 Quaternion Approaches to Visualizing Protein Structure are worked out in detail in our JMGM article: A.J. Hanson and S. Thakur, "Quaternion maps of global protein structure," Journal of Molecular Graphics and Modelling, Volume 38, September 2012, pp. 256--278. (Alternate URL here), and (Local version here). Quaternion maps of protein amino acid residues provide an alternative to Ramachandran plots for orientation analysis. Several alternative orientation frame systems can be chosen, with the residue-local Cα-centered frame being the default. Quaternion maps are noteworthy for their ability to compare the orientations of arbitrary sets of sequential or non-sequential residues located anywhere on the protein, and for the resulting opportunity to observe and analyze the statistical properties of global orientation clusters. Only the quaternion representation of orientation frames embodies a natural rigorous measure for comparing properties of sets of global orientation frames. Quaternion Applications were covered in our updated quaternion tutorial lectures presented at Siggraph Asia 2012, 29 November in Singapore. Special application topics included optimal, smoothly controllable tubing and tube texturing, quaternion protein maps, and how dual quaternions solve the conundrum of how a quaternion acts on a vector. The latter is a long-standing controversy that pitted Hamilton against many contemporaries, and has been described in wondrous detail by Altmann in "Hamilton, Rodrigues, and the Quaternion Scandal." The solution is simply to replace Hamilton's impossible candidate for a "Vector," the binary rotation quaternion (0, (x, y, z) ) by the dual quaternion vector, namely (0, ε(x, y, z) ), with ε having the dimension of inverse length and satisfying ε2 = 0 . Visualizing Relativity using complexified quaternions was part of the material covered by Andrew Hanson and Daniel Weiskopf in their Siggraph 2001 Course 15 Notes. The Solar Journey Movie is an educational computer animated film on the astronomy of the local neighborhood of the Earth and the Sun developed as part of our NASA-sponsored research work. A DVD version containing the Solar Journey animation and supplementary science materials exists but is no longer marketed. Some day I'll put together an annotated bibliography, but for now see the Google Scholar and DBLP project links at the top of the web page. Here is a summary of my historically most highly cited work, and together with some media links. The Eguchi-Hanson metric (Physics Letters 74B, pp. 249--251 (1978)) is a vacuum solution of the Euclidean Einstein equations that is the first known instance of an important class of metrics now commonly referred to as ALE or Asymptotically Locally Euclidean metrics. A comprehensive review of Euclidean Einstein metrics and the context of the Eguchi-Hanson metric is given in our 1979 Annals of Physics review article. 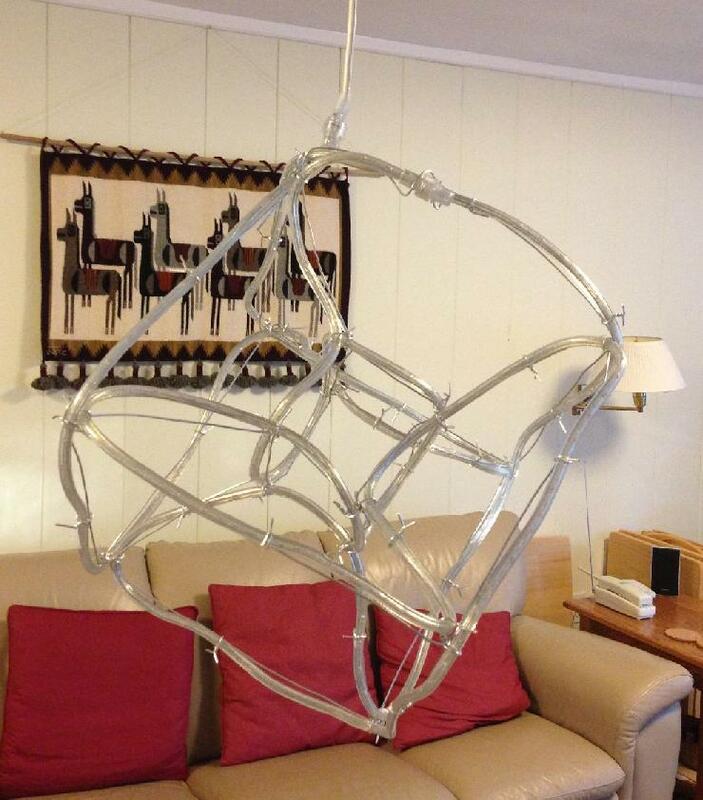 This work won the Second Prize in the 1979 Gravity Research Foundation Competition; see T. Eguchi and A.J.Hanson, "Gravitational Instantons," Journal of General Relativity and Gravitation, 11, pp. 315--320 (1979). Our comprehensive introduction to the ways in which the languages of the theoretical physics and mathematics communities became inseparably connected after a long history of going their separate ways is available in the 1980 Physics Reports article "Gravitation, Gauge Theories and Differential Geometry" by Eguchi, Gilkey, and Hanson. Constrained Hamiltonian Systems, is a short book by Hanson, Regge, and Teitelboim, originally published in 1976 by the Accademia Nazionale dei Lincei (Contributi del Centro Linceo Interdisc. di Scienze Matem. e loro Applic., No.22, Accademia Nazionale dei Lincei, Rome, 135 pages (1976)). Actual print copies of this work are rare and generally unavailable. Media. The four-dimensional MeshView viewer is described in the Meshview tech note, and downloadable software is located HERE. Supported fully under X-windows/Motif only. Precompiled for Linux, Macintosh, SUN SOLARIS, and SGI IRIX. Recently available: reduced functionality Windows XP version. The shortcuts work in the Windows version, but you need to look at the Linux version to see what they are. My research has focused on several areas of science, including: Mathematical Visualization, Virtual Reality, and Astronomy. in the standard homogeneous coordinates [z0, z1, z2, z3], where n is any positive integer. Note that F(4) in particular is a K3 surface. 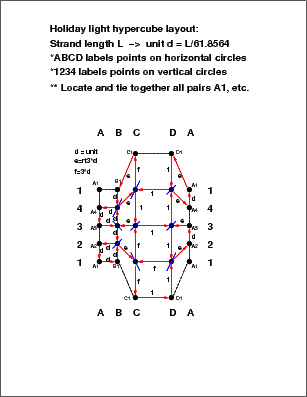 Thus this method provides what is essentially an elegant 24-point tessellation of K3. The outdated original arXiv posting is here: 0804.3218. A local copy can be found here. Dual Five-Point Function Geometry. This work investigates the geometry of two-complex-variable contour integration using the classic 1960's Dual 5-Point Function of the early string model as the critical example. The investigation actually began with some questions introduced in a very early paper, Dual N-Point Functions in PGL(N-2,C)-Invariant Formalism (A. J. Hanson, Physical Review, 1972). 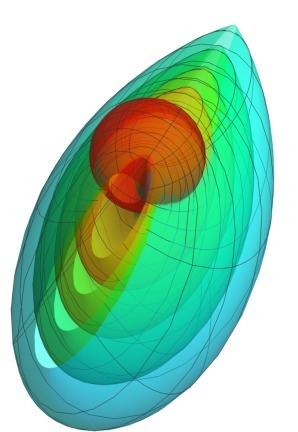 A number of new insights are given in our paper "A Contour Integral Representation for the Dual Five-Point Function and a Symmetry of the Genus Four Surface in R6" by Andrew J. Hanson and Ji-Ping Sha, DOI link 10.1088/0305-4470/39/10/01, which is published in J. Phys. A: Mathematics and General., vol. 39, pages 2509-2537 (2006). There is also a version on the arXiv, math-ph/0510064. A local copy can be found here. Other topics. Various long-term projects deal with techniques for modeling, depicting, and interacting with geometric structures of extreme complexity. 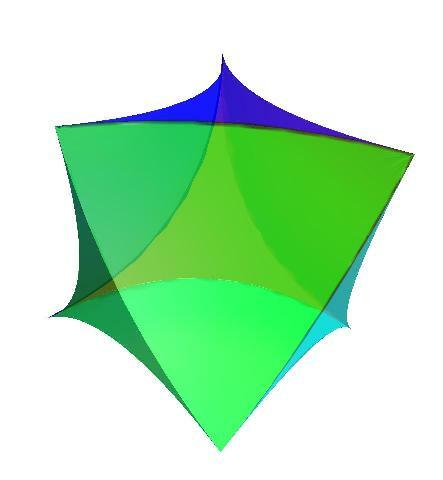 Subject domains of interest range from mathematical objects in four dimensions to exploiting quaternions to represent orientation fields of geometric objects. 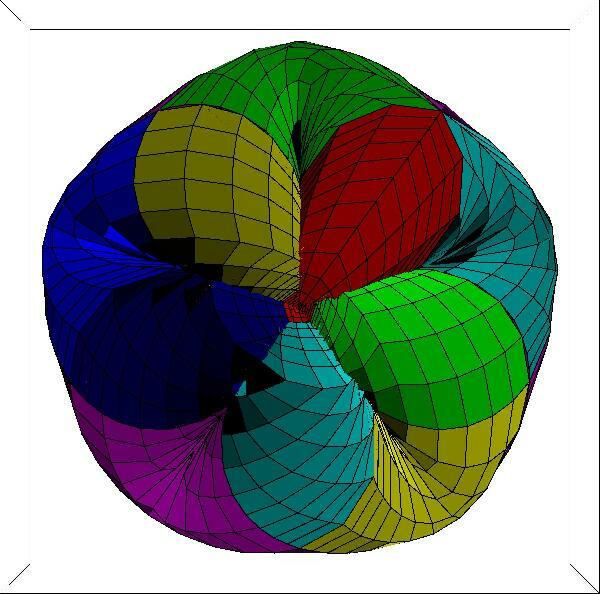 Recent work concerns rephrasing some of the classical differential geometry of curves and surfaces directly in terms of quaternion fields; an application is the determination of optimal framings of curves and surfaces by minimizing appropriate energies of the quaternion frame fields ("quaternion Gauss maps") in the 3-sphere. Minimal Description Length: Applications of MDL to Selected Families of Models: Extensive examples of model selection techniques, with Philip Chi-Wing Fu, appearing in Advances in Minimum Description Length: Theory and Applications, Ch. 5, pp. 125--150. Edited by Peter D. Grunwald, In Jae Myung, and Mark A. Pitt. MIT Press, Cambridge, MA, 2005. A PDF copy of the chapter can be found here. 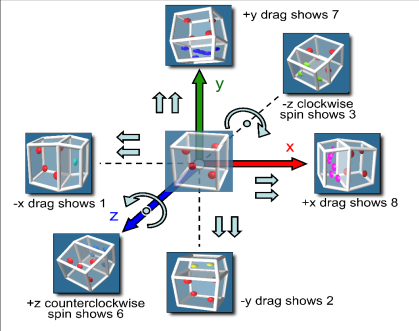 Constrained Navigation: Approach to User Interfaces for Virtual Reality Applications: Work with Eric Wernert on constrained navigation methods for desktop and immersive Virtual Reality systems appear in the Proceedings of IEEE Visualization '97 and '99. Browse our Vis97 paper and our Vis99 paper. An example of our work on star rendering embedded in the Solar Journey package may be found in this QuickTime movie depicting simulated stars, which compares favorably to real images such as Akira Fujii's Orion. Visualizing Multiwavelength Astrophysical Data, Hongwei Li, Chi-Wing Fu, and Andrew J. Hanson, TVCG, Nov/Dec 2008, 14, no. 6, pp. 1555-1562, Proceedings of IEEE Visualization 2008. Describes a unique interactive GPU-driven volume-rendering paradigm tailored to the study of all-sky multispectral astrophysical data. Paper web site. Visualizing Large-Scale Uncertainty in Astrophysical Data, Hongwei Li, Chi-Wing Fu, Yinggang Li, and Andrew J. Hanson, TVCG, Nov/Dec 2007, 13, no. 6, pp. 1540-1647; Proceedings of IEEE Visualization 2007. Astrophysical data is characterized by a wide variety of uncertainties and error sources; this work provides a set of tools for examining and visualizing these features. Paper and web site. A Transparently Scalable Visualization Architecture for Exploring the Universe, TVCG, Jan/Feb 2007, is a full description of work done mainly by Chi-Wing Fu in my laboratory. This framework supports transparent interactive navigation across enormous scale ranges such as those naturally occurring in astronomy. Paper and web site. 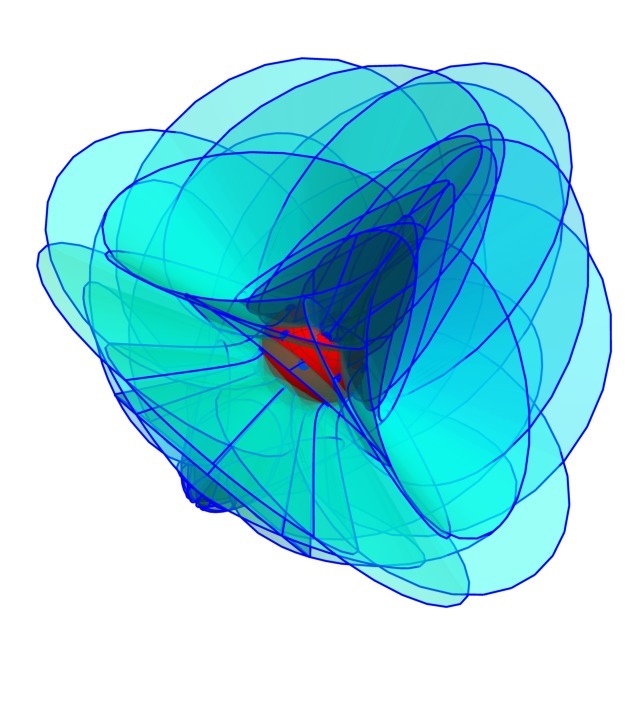 Scalable WIM: Effective Exploration in Large-scale Astrophysical Environments, TVCG, Sept/Oct 2006, 12, pp. 1005-1011; Proceedings of IEEE Visualization 2006. Describes a World-in-Miniature interface design for astrophysical exploration whose development was led by Yinggang Li in my laboratory. Paper and web site. Approach to the Black Hole at the Galactic Core. This animation represents an assembly of data collected by astronomers all over the world to examine the surroundings of the Black Hole suspected to be present at the center of our Milky Way galaxy. A variety of scientific instruments, using different methods and different wavelengths have been utilized to get many orders of magnitude of image precision. This permits us to make a continuous fly-in starting from the familiar constellations and going all the way in to the stars actually orbiting the Black Hole itself. Satellites in our Sky (GMT June 24th 2003 2:21pm). We have over a thousand satellites flying through the sky over our heads. This image is from a brief animation representing a user's interaction with our Earthday graphics program. 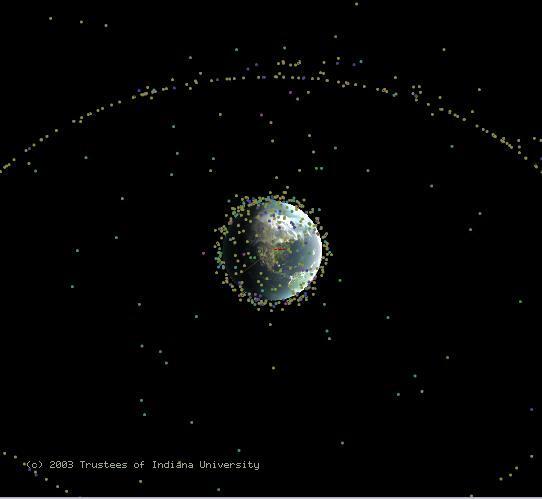 The animation shows a large portion of these at a selected time, and then zooms in for a closeup of the International Space station (ISS). We can clearly see the ring structure of geo-stationary (deep-space) satellites rotating with the Earth, located 38,500km above the Earth's surface (about 6 times the radius of the Earth). The entire animation appeared as the Astronomy Picture of the Day on 14 July 2003. See APOD 2003 July 14. Our initial work on handling very large scales of spacetime in interactive virtual reality environments is described in our paper, Very large scale visualization methods for astrophysical data, which appears in Proceedings of Joint Eurographics-IEEE TVCG Symposium on Visualization, May 29-31, 2000, Amsterdam, the Netherlands. This paper is part of the published proceedings, © Springer-Verlag. Our most extensive recent work, which appeared in TVCG in January 2007, describes the maturation of the scaling framework developed in Philip Chi-Wing Fu's PhD thesis, and is entitled "A Transparently Scalable Visualization Architecture for Exploring the Universe." For details, see the summary web site. I have also created a variety of graphics images derived from the Fermat Equation (see below) that are relevant to the Calabi-Yau spaces that may lie at the smallest scales of the unseen dimensions in String Theory; these have appeared in Brian Greene's books, The Elegant Universe and The Fabric of the Cosmos,, and in the book by Callender and Huggins, Physics Meets Philosophy at the Planck Scale. The writhing purple shapes in the October/ November 2003 NOVA production Elegant Universe, as well as the cover of the November 2003 Scientific American, were derived from software models I supplied to the NOVA graphics providers. The resulting surface is embedded in 4D and projected to 3D using Mathematica (left image) and our own interactive MeshView 4D viewer (right image). 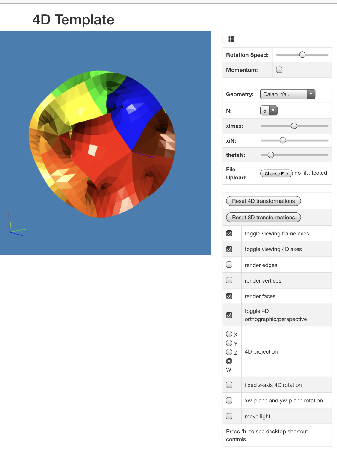 If you have CosmoPlayer, you can also interact with this VRML version of the quintic Calabi-Yau cross-section. In the right-hand image, each point on the surface where five different-colored patches come together is a fixed point of a complex phase transformation; the colors are weighted by the amount of the phase displacement in z1 (red) and in z2 (green) from the fundamental domain, which is drawn in blue and is partially visible in the background. Thus the fact that there are five regions fanning out from each fixed point clearly emphasizes the quintic nature of this surface. For further information, see: A.J. Hanson. A construction for computer visualization of certain complex curves. Notices of the Amer. Math. Soc., 41(9):1156-1163, November/December 1994. An interactive version is available at the Wolfram Demonstrations Project Calabi-Yau Space page, based on the Hanson paper cited above, with assistance from Jeff Bryant. m = n = 0 and m = n = 1. 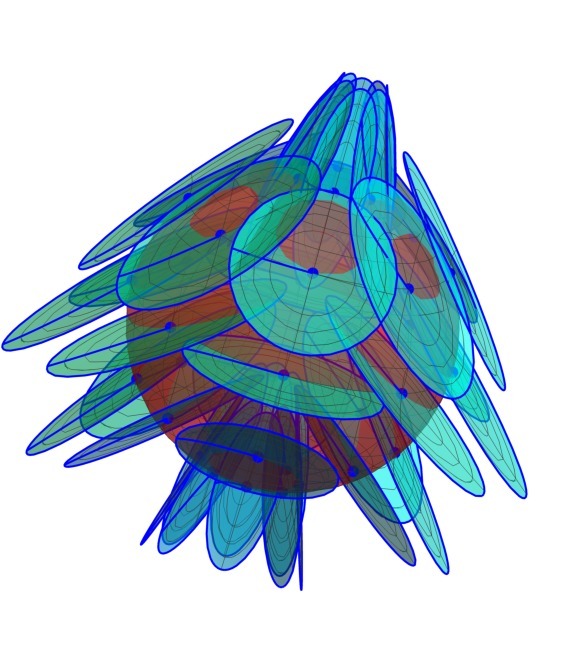 For more information about mathematical visualization in general, see the Web version of the review article Interactive Methods for Visualizable Geometry, by A.J. Hanson, T. Munzner, and G. Francis, published in IEEE Computer 27 , No. 7, pp. 73--83 (IEEE Computer Society Press, Los Alamitos, CA, July, 1994). Observing the Universe using the finite speed of light to place measured objects in their correct temporal context. The Cosmic Bloom excerpt from the movie as available here; it seems to play OK on PC's with QuickTime, but has troubles on some other platforms. This 3:35 minute animation contains a visualization of the entire Universe from three different points of view: the time spectrum of observable photon radiation arriving at the earth, the constant-time shells of light sources represented in "comoving coordinates " (as though the Universe had always been the size it is today), and in "physical coordinates" (which incorporate the Hubble expansion since the "Great Flash", when the Universe was about 300,000 years old). This film was one of a select few chosen for showing at the Siggraph 2000 Electronic Theater in July 2000, and appears in Siggraph Video Review 134, Scene 5 (2000). Approach to the Black Hole at the Galactic Core. This animation represents an assembly of data collected by astronomers all over the world to examine the surroundings of the Black Hole suspected to be present at the center of our Milky Way galaxy. A variety of scientific instruments, using different methods and different wavelengths have been utilized to get many orders of magnitude of image precision. This permits us to make a continuous fly-in starting from the familiar constellations and going all the way in to the stars actually orbiting the Black Hole itself. 4Dice: Local version with narration. 4Dice: YouTube version with narration. This short (1:00 minute) animation of a back-face-culled 4D die or hypercube, which has eight sphere-containing cubes as the analogs of faces, was shown at the Siggraph '95 Computer Animation Festival and appears in Siggraph Video Review 114, Scene 14 (1995). Fermat's last theorem was proven at last in 1995 by Andrew Wiles, but the mystique lives on. This film was made in 1990, when it was still unclear that Fermat's conjecture would ever actually be proven --- in a way it was more romantic when we could believe that, wasn't it? The film was shown in the Siggraph '90 Animation Screening Room, and appears in Siggraph Video Review 61, Scene 4 (1990). Andrew J. Hanson: Last revised 26 October 2018.